Added all that into the github repository, but I haven't gotten around to testing or working on any other bugs today. I'm not sure if it's been addressed already, but is there a fix for this nonsense? Oh yeah. I fixed that too... I seem to recall it involved a good bit of trial-and-error and changes in multiple places, so I'll have to see if I can figure out what all it was now. But basically I changed the ropes to align to the grid before flying up, instead of before coming down. Thanks, that was an easy fix - works great now! Just copied the alignment code already there to be used while the rope is moving upwards. See also Urza's bug fix for ropes below. At the same time I thought to add something to prevent wasting ropes if launched in a confined (2 block high) space. If an 'armed' oRopeThrow hits the ceiling and has travelled less than 32 pixels from the point the player launched it, the rope fails to hook into the wall and instead falls back to the ground where it can be picked up again. This check only works if the player launched the rope while standing on the ground, as in some situations the player could be jumping out from a ledge and back to toss the rope and intentionally hit the ceiling with it. I'm not proposing this one as necessary for the community update, but I have experience stupidly wasting ropes in such a way. At the same time I thought to add something to prevent wasting ropes if launched in a confined (2 block high) space. I'm not proposing this one as necessary for the community update, but I have experience stupidly wasting ropes in such a way. Yeah I think we probably ought to leave that out, since it could be limiting an intentional not really a bug action. (Or maybe it was on the right?) Anyway, you might want to quickly check that doens't happen with your fix. I couldn't find such weirdness while facing left or right..thanks though! So this is funny, apparently the rope-through-walls bug was in the original game. I just happened to find it while testing the my rope-snapping changes. But it only happens in a specific combination of circumstances. Namely, when you use a held rope (not with the rope key) and you are ducking. And change those two 16s to 12s. I see it now...I was using a held rope but didn't try crouching. I was able to fix that at least in some cases by tweaking their bounding boxes. And the bat has the opposite problem, you can hit IT through walls. I haven't tried it with all the others, or tested exactly which ones suffer from this in the first place, althoguh I think frogs do. With the two frogs and zombie, you can whip them through a wall, and if you are in the higher diagonal gap, they can hit you when they jump, AND you can kill them by jumping. There's others but I don't feel like messing with them now. From the upper position the player can stun a vampire and pick him up through the wall. I seem to remember hearing about that one before. Using the latest revision, found an old bug that I forgot about. Music on title screen does not loop. Not sure if this happens in all cases or only if you get the the title screen without pressing any buttons to skip the intro. oTitle.Alarm3 should call 'playMusic' instead of 'playSound'. The arguments are OK. The value of oEmerald is $200, but oSapphire and oRuby are both worth $400. 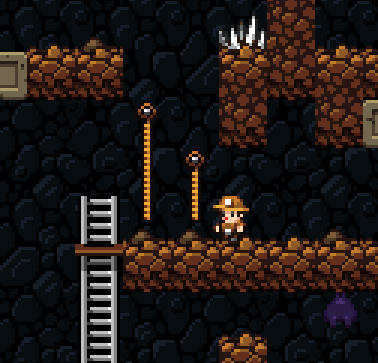 oSapphire should probably be worth $300 to match Spelunky HD.